I am passionate about creating beautifully natural wedding photographs, capturing as many of those precious moments of joy and laughter as possible. 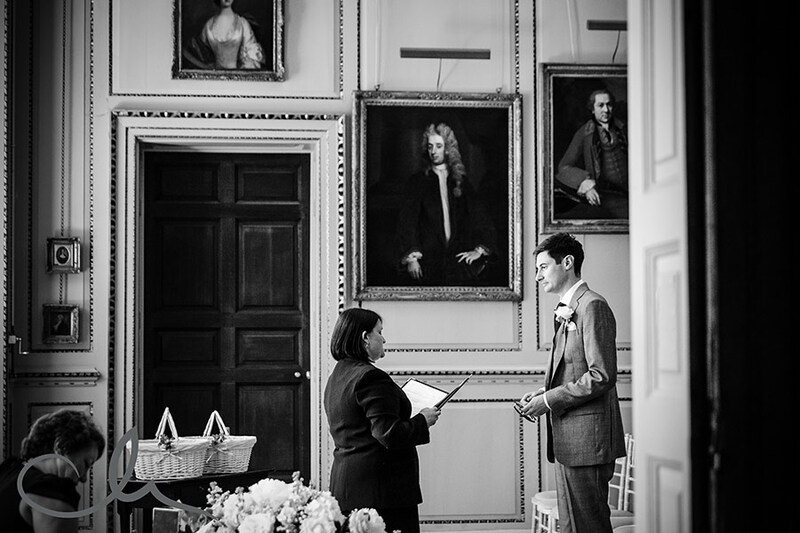 Jocelyn and Nick’s wonderfully lively wedding this June at Bradbourne House in Kent was full of joy and sparkle, giving me a wealth of opportunities. Jocelyn looked a dream as she entered the Great Hall and caught sight of Nick, waiting for her at the altar. Her beautifully expressive eyes were so gorgeous to capture on film and that look just said it all. It’s the splendour of the wedding venue, the detailing of the bride and groom’s outfits and the little style touches that create a wonderful background to the day, and this wedding had them in abundance. From the gorgeous linear pearl beading on Jocelyn’s dress (Maggie Sotero at Go Bridal), to Nick’s timelessly stylish suit from Cad & The Dandy, through to the beautiful vintage colour flowers from Florian Flowers and the gorgeous semi naked wedding cake with matching vintage roses by Flossie Pops Cakery – everything was beautifully co-ordinated and a feast for the eyes. Nick’s mother even made the wonderful fudge for the favours, contained in beautiful paper birdcages. Lawn games were a plenty and musician Jonny Holliday was absolutly fabulous and so original! Some wonderful moments of hilarity during the speeches, provided images that were the perfect counterpoint to the solemnity of the wedding ceremony. Joycelyn’s father in particular, had everybody in stitches. Both Jocelyn and Nick came ‘under fire’ during the speeches, producing some of my favourite shots of the whole wedding – the expressions on their faces are hilarious! The sunlight flooded through the windows of the Great hall, illuminating the warm light oak floors and rich tiffany blue walls, creating a beautiful spotlight on the couple and their guests. The Tudor Grade 1 listed Bradbourne House is owned by the East Malling Trust for Horticultural Research, and it’s no surprise that the twenty acres of grounds and parkland are exquisite. It provided us with some beautiful spaces for our couple shots, including their wonderful Kentish orchards. The timing of the couple shots is really important, and not always easy to achieve in such an action-packed day. The gorgeously romantic images I managed to capture of Jocelyn and Nick, in the soft evening light and silhouetted against the setting sun, show the value of planning the photography and the itinerary of the day in detail beforehand. I loved the sheer joy that Jocelyn and Nick exuded throughout their magical day. It was such a pleasure to be part of their elegant, fun wedding!